Migratory tribes of indigenous people inhabited the Midwestern State of Indiana perhaps as early as 8000 BC. Multiple tribes succeeded each other in terms of regional dominance for thousands of years. The mound-building cultures of the area, also known as Mississippian culture had become prominent at the time of first contact with European explorers. In the 1670’s, the area was claimed as a territory for the Kingdom of France. The claim was relatively meaningless as France established virtually no settlement in the area. Following their defeat at the hands of Great Britain during the Seven Years War, Indiana became a territory of the crown, before being ceded to the United States at the conclusion of the Revolutionary War. 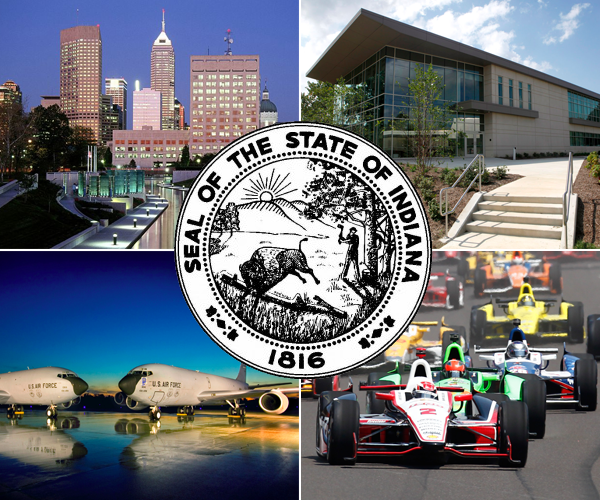 Indiana was named the nineteenth state of America in 1816. Largely a frontier, the area was transformed following statehood with the construction of roads, canals, the railroads and state-funded public schools. Today, the state is home to 6,570,902 residents. The state is the 38th largest by area and the 16th most populous. Indianapolis is both the capital and largest city in the state. 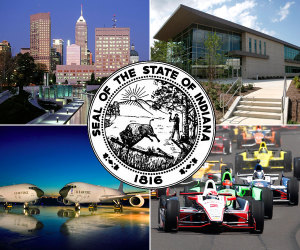 Additionally, there are a number of other metropolitan areas that serve as a draw for residents, including Fort Wayne, Evansville, and Bloomington. As of 2012, 70 percent of state residents live in metropolitan areas. The economy is reliant on manufacturing, and the state is home to the headquarters of the pharmaceutical company Eli Lilly as well as Mead Johnson Nutritionals. Indiana is the fifth largest of all states in terms of sales and shipments of pharmaceutical products. Located on the Corn and Grain Belt, Indiana is a major agricultural distributor. Cash crops and exports include corn, soybeans, dairy, melons, tomatoes, grapes, mint, and tobacco. Because of the large woodland area in the southern portion of the state, a fairly large furniture making sector of the economy exists. The average home cost in Indiana is $115,000. In the past twelve months, home appreciation was one percent. Cost of living in Indiana is 14 percent below the American average. Unemployment is also lower by nearly a full percent in Indiana than the U.S. average. There are two military bases in the state: Grissom Air Reserve Base and the Naval Surface Warfare Center Crane Division. There are nearly 500,000 veterans living in Indiana. The property tax exemption is available to certain veterans. The exemption is up to $37,440 if they are 100 percent disabled or is over the age of 62 and are suffering from a disability of ten percent or greater. A veteran who purchases property in the state of Indiana using a VA home loan is not required to have a termite inspection. If you own property in Indiana and require help selling your home, complete the form below or call 888-573-4496. If you lack enough equity to sell your home, click here. VA Home Loan Centers provides services at no out of pocket cost to homeowners. Veterans and service members may be able to re-use their VA benefit for the purchase of another home.